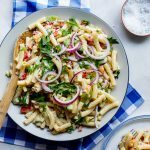 Macaroni salad is the perfect side dish for casual summer eating. This easy creamy curried macaroni salad recipe is a twist on an old classic. Combine the cooked macaroni with the remaining salad ingredients. Stir together all the dressing ingredients. Pour ¾ of the dressing over the salad and mix well. Reserve the rest of the dressing. Just before serving, pour over the remaining dressing and mix well.